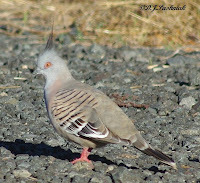 Crested Pigeons (or Topknots as they are sometimes called) have been in my yard ever since I moved here. I think they have been nesting in some thick shrubs in my neighbor's yard. They have foraged around the yard and perched up on the electricity wires. I would certainly miss seeing them if they were not here. A few years ago a new bird started perching and foraging in the same places. 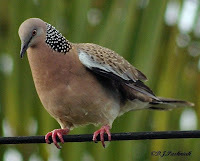 It is a Spotted Turtle Dove which was introduced into Australia from the 1860s onward and is expanding its range all the time. 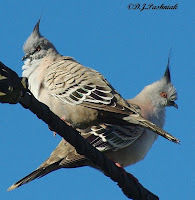 In the last few weeks I have been seeing fewer Crested Pigeons and more Spotted Turtle Doves and it even seems that the Doves are taking over the shrubs where the Pigeons formerly nested. Introduced species always change the balance of the environment. Unfortunately our native species don't seem to compete so well. Of course, all introduced species are more carefully managed now but we are still left with the problems created by earlier introductions which were allowed before it was realized just how delicately balanced the environment is. I hope the Doves don't push the Pigeons out of my yard! My first post on the Watery Wednesday page. I love being beside - on - or in - the water - and often take photos of it just to try to capture the beauty of the moment. I can't concentrate on the birds ALL the time :-) This photo was taken yesterday morning from Norman Point. While walking along the Tin Can Bay foreshore the other morning I watched quite a number of Gull-billed Terns. It was especially interesting to see one bird showing some juvenile plumage. This one is possibly not more than 3-4 months old. These terns are resident here but they go to inland waters to breed when the conditions there are right. Exactly where the ones from this area go is apparently not known. A couple of years ago I saw a young bird with this much juvenile plumage, but never with more than this. This photo shows two birds in adult plumage on the left, the one in the middle has some white showing in its cap as it goes into non-breeding plumage, and the bird on the right is a Caspian Tern. This photo shows a Crested Tern in non-breeding plumage and behind it a juvenile (or maybe a non-breeding) Gull-billed Tern. Crested, Caspian and Gull-billed Terns are the three terns resident in this area. All of them spend a short time away in other areas of Australia during their breeding. Yesterday morning I decided to go for a walk along the foreshore at Tin Can Bay to look for waders as well as whatever other birds were around. 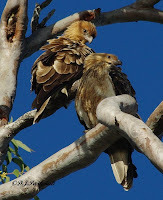 I was at the southern end close to Crab Creek and was trying to find a Kingfisher which had briefly flashed across in front of me when I heard the distinctive sound of Whistling Kites somewhere overhead. Usually these birds glide overhead and then out of view but this time I spotted two birds sitting in the sunshine and preening. These two saw me but then decided they could ignore me and get on with the important task of putting every feather into place. They looked rather different from their usual sleek selves with their feathers all fluffed up. Ten minutes later they had both left their perch and I saw one gliding overhead. 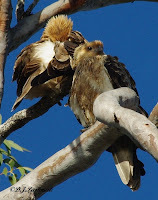 Visit the Bird Photography Weekly to see other bird photographs. I walked north along the foreshore from the Mullens Creek picnic area the other morning. The Paperbarks are in flower right now. Of course they flower every year about this time, but some years they produce a very heavy crop of honey and this must be one of those years. There were birds everywhere among the flowers and so busy that they seemed to ignore me and my camera. The Wattles were also flowering - more pollen than nectar from their flowers. Even the Mistletoe was in flower. The tide was low and I walked to the saltmarsh flats and along the southern edge where the trees meet the saltmarsh plants. Looking the other way the bay was totally empty of any water. Its hard to imagine that at very high tide the water here is 1-2 meters deep. I have never seen and heard so many birds in this area. The flowers must have also attracted all kinds of insects and the insect eating birds were also making the most of the feast! 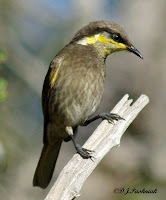 Mangrove Honeyeaters were everywhere - not worried how close I came as long as they had a few leaves to hide among. Brown Honeyeaters were also making the most of the nectar - but not quite so easy to get close to. 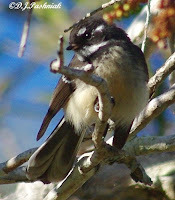 Grey Fantails perched on branches and then flew off with a dive and a flutter after the insects. 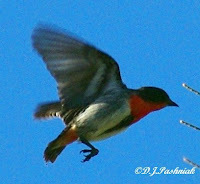 Mistletoebirds were making similar swift darts high in the trees. 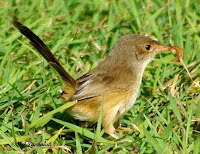 There were Rufous Whistlers around but only the female came close enough for photos. A Varied Triller came down close for a short time. 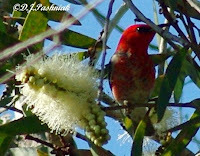 There were numbers of Scarlet Honeyeaters high in the trees but they would not sit still for more than a rather blurred photo! 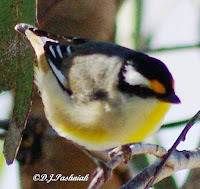 A Striated Pardalote was in a low tree close to where I had left the car. A very nice finish to an exceptional morning of bird watching. I went back to the same place the next day and took more notice of the larger birds. I saw Noisy Friarbirds, Little Friarbirds, Little Wattlebirds, Rainbow Lorikeets, a Restless Flycatcher, and a Black-faced Cuckoo-shrike. Over the last few weeks a small flock of these birds has been wandering through the vacant blocks around my house. In pasture land such as these vacant blocks they will eat grubs and insects. They also feed around water where they will eat small aquatic creatures and even frogs or small snakes. Something disturbed these birds the other afternoon and they flew up over my house. Last week I attended a rainforest workshop presented by Marc Russell from the Mary River Catchment Coordinating Committee. In the morning Marc explained how to ID rainforest species by using the key in the book "Rainforest Trees amd Shrubs" by Harden, McDonald, and Williams. He then set small groups the task of ID'ing samples that he provided. This was definitely challenging! In the afternoon we travelled to the Bymien Picnic area and walked around one of the trails through the rainforest while Marc ID'd trees and shrubs and commented on their growth. This was all new to me so I did not get as much benefit as those who came with a lot more knowledge to begin with. I must admit that part way through the walk I heard birds in the distance so went off by myself where I could see and hear them away from the noise of the conversation. There were birds feeding high in the canopy which I could not ID, a number of Fantails swooping through the rays of sunshine - I assume for insects - and on the forest floor a very small bird busily hunting around in the leaf litter. By this time it was late afternoon and the light was too dark for the automatic focus to work on the camera and I was too slow with the manual focus! 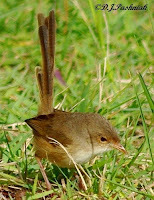 The highlight of the day was this little female Red-backed Wren that was busy hunting around in the grass. You can see how tiny she is by the stems and blades of grass that she was hunting among. The caterpillar or grub that she caught almost looks too big for such a tiny bird. The male Red-backed Wren was also around - but not nearly so easy to photograph successfully. 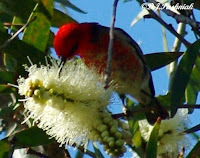 There were also a number of honeyeaters high up in the trees among the Paperbark flowers. 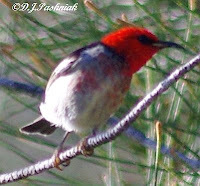 The Scarlet Honeyeaters have eluded me until now - but they were still too far away to give really good clear views. This morning was nearly perfect. There had been some fog around earlier but it did not last when the sun got up. Although high tide was just before 8am it was only listed as 2.41M. The tide last night by contrast was 2.98M. I could still see where the birds had roosted last night but this morning the water was well out on the sand flats and there was no reason for the birds to even come up to their normal roosting place. I saw a small flock of Red-capped Plovers and a few Double-banded Plovers. There were also a few Gull-billed Terns standing at the edge of the water. There were no other waders to be seen. The Paperbark was in full flower and even my poor human nose could smell the honey/nectar. Lovely! 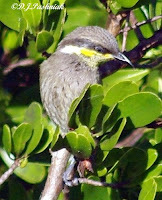 There were Mangrove Honeyeaters all along the foreshore - all singing at the top of their voices! -but they are experts at staying just behind the leaves and almost out of sight. This one sat in full view just long enough for me to get a photo. I wished I had also taken my old Canon S2 which has video and therefor sound recording. As I walked back to the car park area I could see a number of white birds roosting at the edge of the water. There are often numbers of Little Egrets in this area and I assumed that is what they were. However, as I got closer some appeared larger - and photos showed a Royal Spoonbill. Then the two birds that had been perched in the trees flew off and they were Great Egrets. It was too far away for good photos but even record shots are interesting to show birds not usually seen right here. My dog Misty really enjoys this walk with me. (I have said before that she is a Stumpy-tailed Blue Cattle Dog - some call them Smithfields. They are born without tails.) I have had her since she was a tiny pup and although she had always been allowed to run off the lead, when I saw birds she was quickly put on the lead and made to stand behind my legs while I looked and took photos. However, things have changed now. She often sees the birds before I do and she comes up behind me and gives me a little nudge on the back of the leg with her nose to let me know that I should have the camera up and be taking photos of whatever she has seen. This morning she thought I hadn't seen the Red-capped Plovers on a rather distant sand bank so came and gave me a nudge. However, they were too distant for good photos. When I have finished and move off she runs off too and continues exploring all the interesting things she finds down there. Its always a favorite game to chase the little fish that she sees in the shallow water. With all the splashing that goes on no fish ever gets anywhere near being caught! Well, the two are really not connected! - except that both were obvious yesterday while going out to Inskip. I stopped to look at the beach and the erosion that has been happening due to all the rough weather we have recently had. Many of the vehicle tracks down on to the beach are closed. This is one that used to be in constant use - but even to walk down is a scramble now. The truck in this photo had used a different beach access. The erosion has not only cut back the sand banks but it has also washed down a lot of vegetation from the tops of the dunes. This is now littering the edges of the beach but will eventually be washed into the sea with the higher tides. I was taking a photo looking southwards to Rainbow Beach but also got part of a beach party in the photo. They MUST have been tourists from the northern hemisphere where it is MUCH colder than here. Who else would think it was warm enough to sun-bake in June - WINTER! The road from Rainbow Beach out to Inskip Point is very low lying and much of the natural vegetation is Paper-barked Tea Tree (Melaleuca quinquenervia). Yesterday, many of these trees were in full flower and made a very pretty sight alongside the road. Paperbark (as it is commonly called) has a good honey flow and the birds and insects all enjoy the nectar. 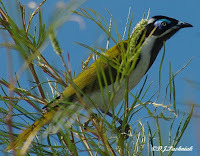 I said in my last post that Blue-faced Honeyeaters were noisy and aggressive! Well here's the proof about aggressive! 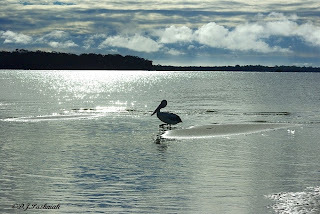 This photo was taken this morning at Inskip Point. 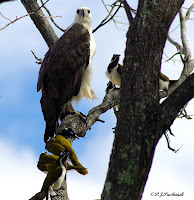 I count six of them all annoying the Sea Eagle! 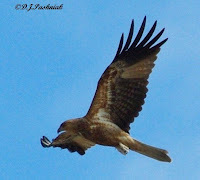 Some time later another Sea Eagle flew off over the sand flats and I photographed it soaring out there. From the underneath pattern on it's wings it looks like a juvenile to me. 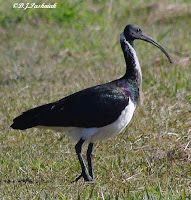 These birds are very common around my yard. They eat a varied diet including nectar, insects and fruits. Sometimes they are called the Banana Bird. Their most striking feature is the large bare skin patch around the eye which in mature birds is a lovely bright blue color. 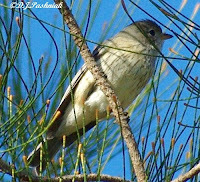 In young birds it is greenish colored. I have cropped one of the photos to show this eye patch. They are noisy and aggressive birds - both to other smaller birds and to anything else that they see as invading their territory. They leave my dog alone as she is not a bit scared of them but they have the cat terrified. If they manage to catch the cat out in the open then a whole group of them will fly around scolding and swooping and trying to peck her. Usually at this point the dog delights in rescuing the cat and seeing off the birds! 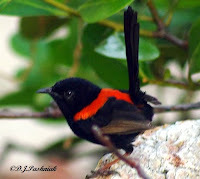 For great bird photos visit the Bird Photography Weekly.